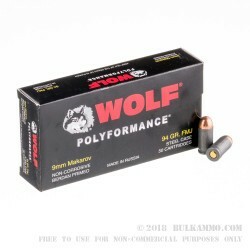 WOLF Performance Ammunition’s defining characteristic is its polymer coated Berdan primed steel casing. The coating not only provides some resistance against corrosion, but also facilitates feeding and ejection in semi-automatic weapons. 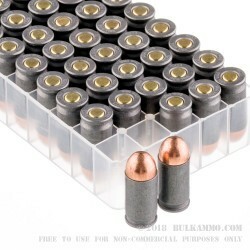 Steel cased ammunition’s primary downside is that it is unsuitable for handloading, but if you don’t handload or don’t mind a significantly less expensive cartridge, then this line of ammunition deserves your attention. This 9×18mm Makarov cartridge sports a 94 grain projectile, a common weight for its caliber. 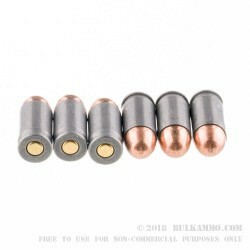 The bullet’s full metal jacket not only gives it superior penetrative capabilities, but will also protect your bore against excessive fouling so you may enjoy more accurate shots in between cleanings. If you have a ČZ vz. 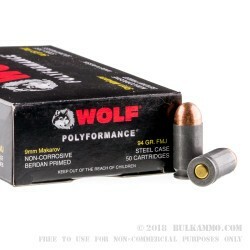 82, FEG PA-63, Makarov PM, or other interesting Russian or Eastern Bloc pistol, then this Russian-made cartridge is an authentic way to enjoy it during your next trip to the range. I shot a box this morning through my Surplus CZ-82 and the ammo performed well. It shot where I was aiming and left an average amount of residue in my gun. The ammo fed fine and I've had no failures. Compared it to Silver Bear 9x18 and they both performed about the same. Always wish things were a bit cheaper but at least it's available thru BulkAmmo.com and their shipping was quick and reliable.